When talking about performance tuning, I will often tell developers that they need to use Oracle SQL*Trace and TKPROF because that is an absolutely reliable way to find out how their SQL executed, how long it took and hence where they should focus their attention to improve performance. However, that requires access to the trace files in the USER_DUMP_DEST directory on the database server, which is something that database administrators are justifiably reticent to provide. When I am on a customer site, I often experience the same difficulties. Even if developers can get a log on to a development database server, trace files will only be readable on Unix servers within the DBA group unless _trace_file_public is set to true. Another option is to retrieve trace files from the user_dump_dest directory via an external table. The idea is not mine. I've seen this technique demonstrated by Tanel Poder, there is an article by Jared Still that demonstrates how to retrieve the alert log, and there is also an posting on Ask Tom using utl_dir. However, I couldn't find a script to do trace files, so I wrote one. The script assumes the trace file is created by the current session. The first thing it does is to create a database directory that maps to the USER_DUMP_DEST directory, and an external table that corresponds to the trace file. Then you can just query the trace file in SQL*PLus and spool the output to a local file. Of course, this also shows that external tables are a significant security risk. The privilege to create and read from directories carefully controlled. REM (c) Go-Faster Consultancy Ltd.
REM trace the thing you are interested in. are maintained by PeopleTools, but which themselves are not maintained by PeopleTools. This is often as a result of performance tuning activities where you choose to use features of the Oracle database that PeopleSoft do not use because they are not available on other database platforms. Record based auditing can be done with a database DML trigger, instead of the default functionality of the Application Server. This was implemented by PeopleSoft to improve performance of the auditing, and is a rare example of PeopleSoft coding specific code for each platform because the trigger DDL is slightly different. 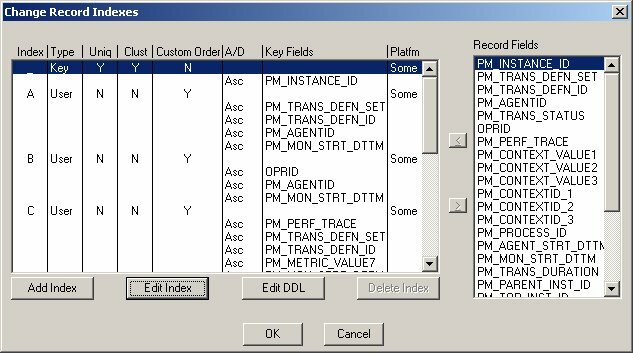 However, these objects are not created by the DDL scripts built by the Application Designer, and can accidentally be lost when the table is altered with an 'alter by recname' script generated by Application Designer. The implications can be quite serious. If the auditing trigger were to be lost, then the application would continue to run, but no audit data would be produced, and no error would be raised. If a trigger is being dropped or altered, and the name of that trigger does not start with PSU, then an error is raised. Triggers that are named PSU% are created by Application Designer for use with Mobile Agents If an index is dropped or altered, the trigger checks that it is defined in PeopleTools. 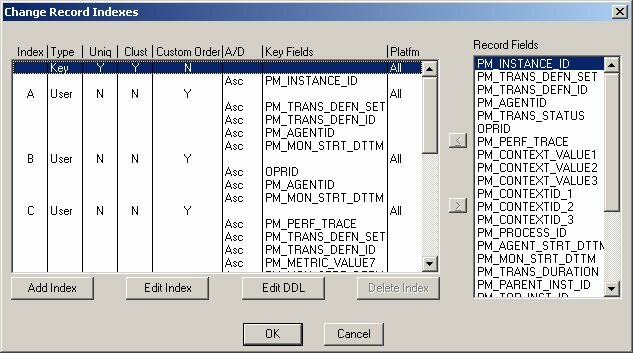 Indexes that correspond to Unique, Duplicate and Alternate Keys in Application Designer (where the index name is 'PS', followed by either a digit or an underscore, followed by the record name) are ignored. 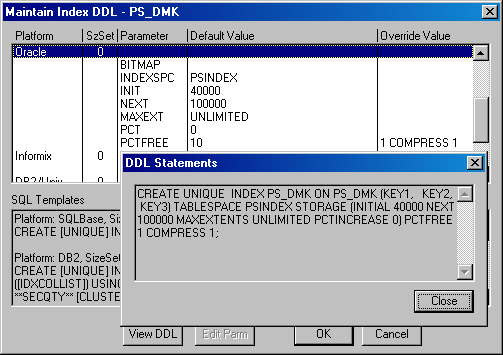 If a table is dropped or altered, the DDL trigger checks than there are no user indexes or triggers not defined in PeopleSoft, nor any primary key constraints, materialized views or materialized view logs on the table. It also checks that the table or index is not partitioned, clustered, global temporary or index organised. If any of the tests fail, then the trigger raises an exception the DDL statement fails with an error message generated in the trigger. The SQL that generated the error is also included in the error text. When an error is generated by this trigger during development or migration activities, it usually indicates that there is another database object that you need to consider before issuing the command that errorred. It is not simply a matter of disabling the trigger and trying again. The trigger does have a couple of side effects. There are a number of SQL statements that are run in the trigger, and this does impact the performance of DDL commands. If you are dropping all the tables in a schema, then it would be advisable to disable the trigger. The trigger definitely needs the following function based index to be created on PSRECDEFN, because it needs to look up the PeopleSoft record from the table name. If a user index is removed from the PeopleTools definition before it is dropped, the trigger will raise an error. However, in such cases it would be better to keep the definition of the index in Application Designer and set the platform radio button to 'None' so that PeopleTools does not build it. That way a comment can be preserved to explain why the index is no longer necessary. The previous version of this trigger (called T_LOCK) did not have this capability, and so I suggested disabling the trigger, but this affected all sessions. Since time immemorial, we were told by PeopleSoft that all numeric, character or required fields in their applications are created as NOT NULL columns in the database. And so we confidently repeat the mantra and build our SQL accordingly. But it is not completely true! Long Character fields in PeopleSoft that are not defined as 'required' in the Application Designer are nullable in the database. Long Character field are usually created as LONG columns in the database unless their length is defined as between 1 and 2000 characters, in which case they are created as VARCHAR2 columns. So a Long Character field of between 1 and 2000 characters becomes a nullable VARCHAR2 column in the database (it has taken me 10 years to find this, and it's yet another piece of errata in my book!). 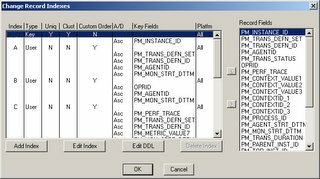 The edit and key options in PeopleTools are restricted on a long field, but nonetheless it opens some interesting possibilities. Including sparse indexes on nullable VARCHAR2 columns, where you identify rows for a query with non-null flags, and set the flag to null afterwards, thus removing it from the index. Use Literal Values: The SQL generated by nVision uses a list of litteral values instead of a joining to one or more tree selector tables. This simplifies the query by reducing the number of tables queried, although the query will be much longer because there will be many criteria on litteral values select from those same tree selector tables. The fewer tables in the from clauses, the fewer way the optimizer will have to execute the statement incorrectly! Use Static Selectors: nVision queries data from the tree selector tables rather than build an extract of part of the trees. Sometimes nVision doesn't clear out this temporary data, usually when it errors for some reason. Hence, debris builds up in the tree selector tables over time an this degrades the performance of the queries. Use Between on the Selection Criteria: This doesn't improve performance, but merely shortens the length of the SQL statement. 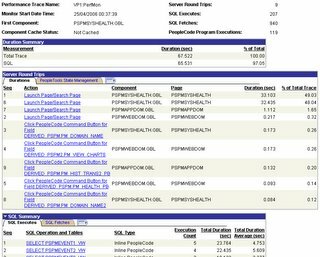 I have noticed on databases that have been upgraded to PT8.45, that most of the indexes say they will build on some database platforms when they will actually build on either all of them, or none of them. 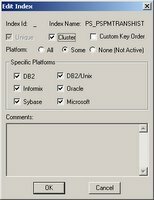 This is because PSINDEXDEFN still contains flags for platforms that are no longer supported by PeopleSoft/Oracle and can no longer be set individually in Application Designer. However, Application Designer still checks the values of these flags and if any flags have different values, then the SOME radio button is selected. However, all six platform flags have the same value. This is a nuisance because PeopleSoft releases indexes for specific platforms, and some indexes are suppressed on certain platforms. It is not easy to see from the indexes view of Application Designer whether this index will be built. It would be easier if it said ALL or NONE when it means that. I have fixed this by updating PeopleTools tables as follows. The first query reports on the indexes where the supported platform flags all have the same value and one of the unsupported platform flags are different. The following SQL commands set the SQL flags for the unsupported platforms to the value for the supported platforms. 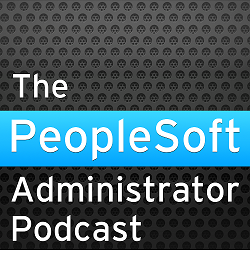 The version number on the record definition is updated so that PeopleSoft reaches the object. The platform flags now say 'ALL'. Not a tremendous change, but at least I can immediately see that these indexes do build on all platforms without having to open each one. Recently, I wrote about the lookup exclusion table, and then I started to think about identifying automatic lookups that should suppressed. The following query will identify all the records that are used as look-up records. I started on the basis that this is a performance issue. I took a minimalist approach that I would only suppress lookups that were consuming a significant amount of tine. So I looked at whether it was possible to use performance Monitor data to identify long running lookups. When you capture a PMU either through sampling or a performance trace you get a heirarchy of the following transactions when you performance a lookup. Note: Transaction 408 is only collected if you have verbose trace enabled for PSAPPSRV. Be aware that this level of tracing can have an impact on performance. 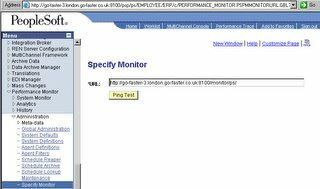 Performance monitor transactions are held in the table PSPMTRANSHIST. This table can become rather large, I found it easier to extract the transaction types that are of interest to me into another table, and then analyse that data. I have constructed two queries to identify component look-ups that are acocunting for a large amount of response time. This first query simply sums the duration and counts the number of executions of each lookup record. Details of the component and page are also available on the table. The other query additionally retrieves the SQL that was run, but this data is only available if the PMU trace was at Verbose level on the PSAPPSRV process. Suppressing the automatic lookup saves the user from waiting for an unnecessary query. The question is what is the criteria for adding a record to the lookup exclusion table. Certainly if a lookup record returns more than 300 rows it should not be executed automatically, because only the first 300 rows will be returned, and then the user will probably not have the row they are looking for and they will have to add search criteria and repeat the search. There is a good case for suppressing the automatic lookup when it returns more than 100 rows. The results will return up to 3 pages of 100 rows per page. 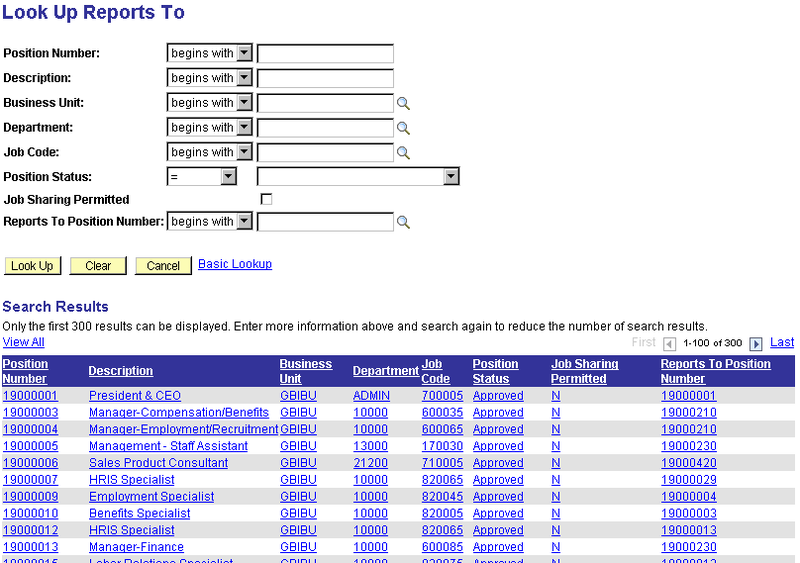 Then the user may well have to navigate to a different page in order to find what they are looking for. Having discussed this issue with a few people, there is some support for the suggestion that the automatic search should be supressed for records with more than 25-50 rows. If there are more rows than this, the user is likely to have to scroll down the page the desired row. The number of rows that a lookup record may retrieve is therefore a good criteria for deciding whether to suppress the automatic lookup. So I have constructed the following SQL script to identify all candidate records and count the number of rows that each returns. First I need a table in which to store the results. 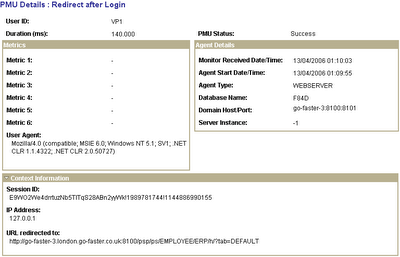 Then all the records with lookup exclusion fields will be copied into our new working storage table. Now, the table LUX_CAND contains a list of all the tables and view used as lookups, and the number of rows that they return (I cannot do anything about PeopleSoft dynamic views). The next thing is to add any record that returns too many rows into the lookup exclusion table. Don't worry about an negative effects of having a large number records in the lookup exclusion table. This information is cached by the application server. Although there is no version number on PSRECXL, when you save an update to the lookup exclusion table, there is component PeopleCode that updates the SYS and PPC version numbers, which causes the application server to recache this table, so that changes take effect immediately. So when updating PSRECXL with this script, it is also necessary to increment the version numbers. 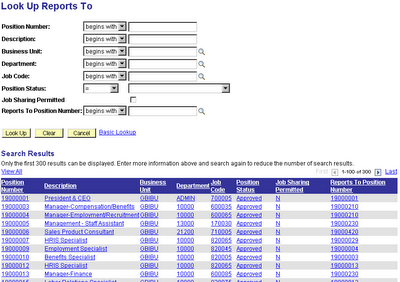 On my Financials 8.4 demo system I found 4089 records being used as lookup records. Of those 557 have over 300 rows, 1058 have over 100 rows, and 1711 records return over 25 rows. On balance, I think that I would be prepared to add all 1711 records to the lookup exclusion table. It would save unecessary searches. One of the catchphrases that I have adopted (I think from Cary Milsap of Hotsos) is 'the fastest way to do something is not to do it at all'. Instead of making something take less time by tuning, it is much better make it take no time at all by not doing it in the first place! This applies to PeopleSoft as much as anything else. In this posting I want to draw attention to the Lookup exclusion table. 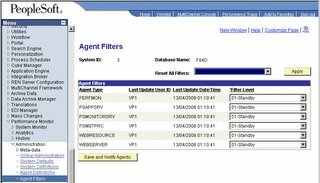 Lots of fields in PeopleSoft applications have lookups associated with them, indicated by the magnifying glass icon. When you click on that you are taken to a lookup dialogue, but normally the search fires automatically. Sometimes the operator must wait a while for the SQL queries to return the data. If there is a lot of data only 300 rows are retrieved into the component buffer, and only the first 100 rows of that set are shown. 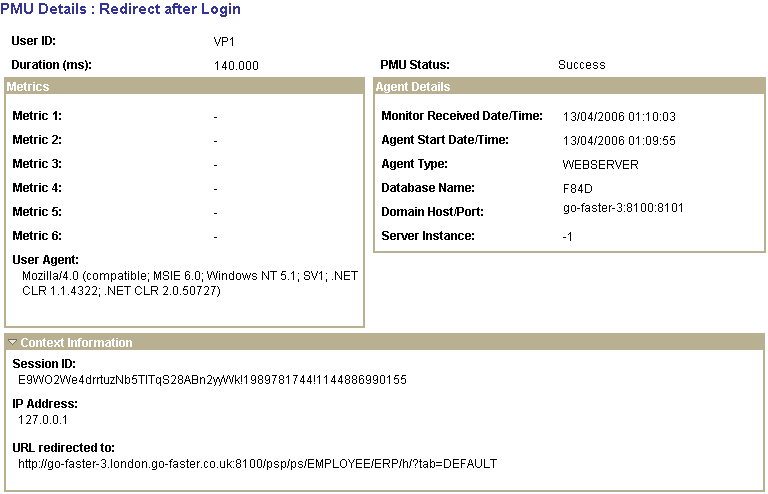 For example, here is an example from Application Hire in HR illustrated with the demo database. These results are usually useless to the operator who must enter criteria into the lookup search dialogue and search again. It would be better if the first automatic search could be suppressed. 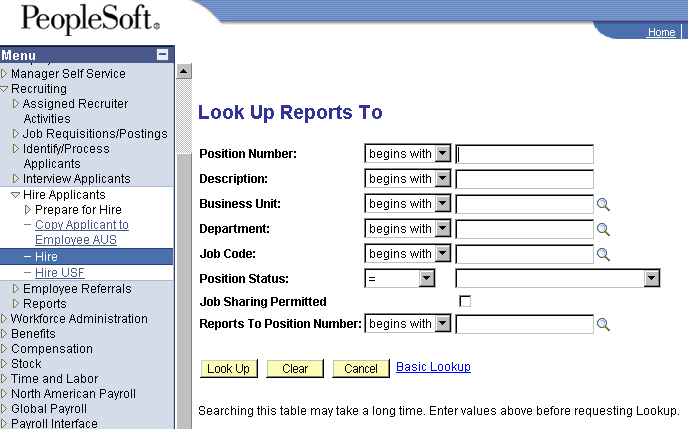 Fortunately, this can be done by putting the prompt table associated with the field on the lookup exclusion table. 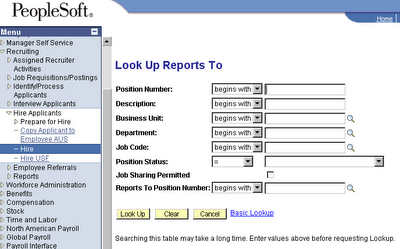 Now the user goes straight into a waiting page and is prompted to enter search criteria to find the relavent data. Even better, the benefit to the user is immediate. You don't have to restart any servers for this configuration setting to be recognised, and for the behaviour of the lookup to change. The lookup exclusion table is a very simple and quick way of improving performance by cutting out unnecessary work. It is also much easier to implement these changes because there are only configuration, rather than customisation. You have to configure it to self-monitor, ignoring all the warning messages. 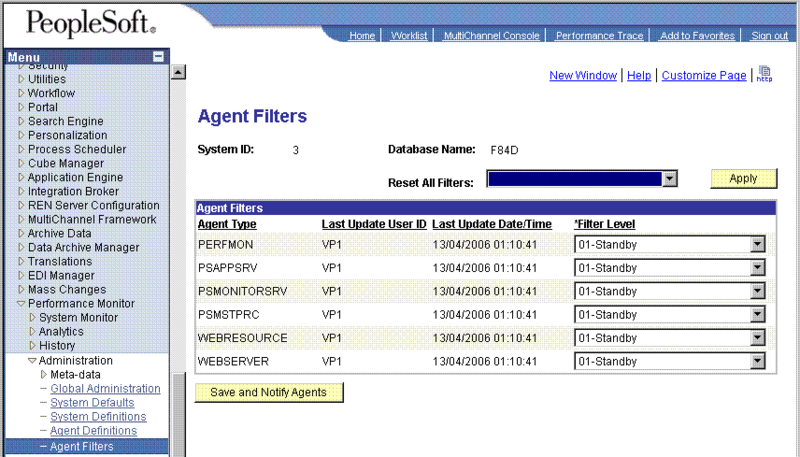 But, you are not interested in the sampled statistics on this database, so disable monitoring by setting the filter level on all agents to standby. The component trace indicates which analytic queries take the most time. I have changed and added the following indexes to the performance tables. I have reduced the free space in the data blocks (PCTFREE) to 0% on tables and indexes, and increased PCTUSED to 99%. If you have performance problems with Performance Monitor, remember that you can also use Performance Monitor to analyse its own analytics. Sometimes it is necessary create certain database objects manually, and not manage them via the Application Designer. However, this can introduce some management problems. When an object is altered in the Application Designer, it is then necessary to build an alter script that may rebuild the whole table. It is easy for the additional objects to be accidentally lost. There are two main scenarios. Additional indexes and Function based indexes: During the course of performance tuning it is often necessary to build additional indexes. Ideally these indexes should be added via the Application Designer. However, a DBA might add an index directly to the production environment, and it may take time to get a project moved into that environment. The other scenario, is that the Application Designer cannot build function-based indexes. These are particularly useful to build upper case indexes on columns, to support case-insensitive searching. PeopleSoft delivers a mechanism to build triggers to perform DML auditing. However, if you then rebuild the underlying table, then the trigger will be lost, and there is nothing PeopleSoft to warn you of this, or to audit this situation. My solution to both scenarios is to create a DDL trigger to prevent accidental ALTER and DROP commands on objects not defined by PeopleTools. When you do want to alter this objects you can then disable this trigger. So you now have a way of controlling when you can and can't drop additional triggers and indexes. You still have to remmeber to switch this trigger back on again! 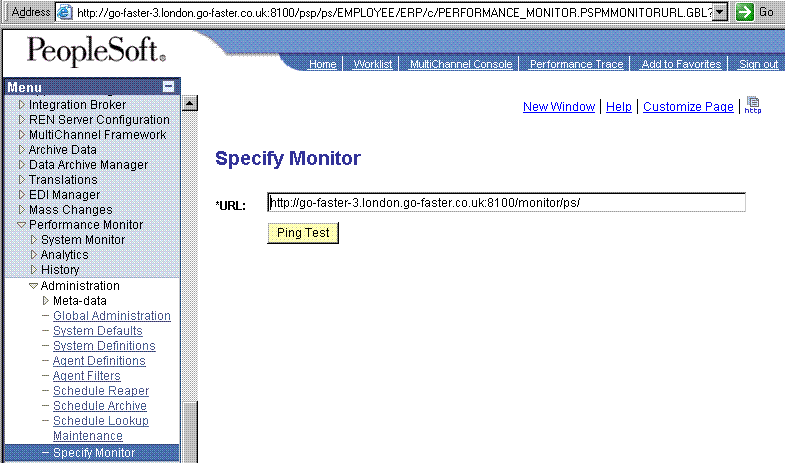 The trigger performs a number of test queries on PeopleTools or Oracle Catalogue views. There are different queries depending upon the type of object being ALTERed or DROPped. If a query returns a row then there is a problem, and an exception is raised. The queries also generate part of the error message that is returned. The trigger only affects operations on tables that are specified in PSRECDEFN as type 0 or 7 records. 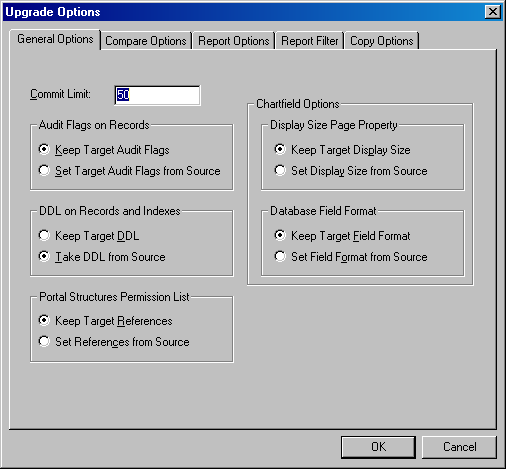 I have not added an handling for the additional instances of a PeopleSoft temporary table. So here are a few tests. I have created a function based index and a two triggers on PS_RT_RATE_TBL. 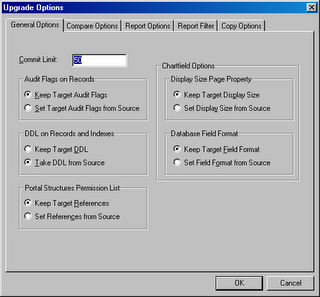 I have chosen this table for the example because it also has a PeopleSoft generated trigger for Mobile agents. So the t_lock trigger prevents me from droping or altering either the function based index or the table. But I can drop any other index on the table that is maintained by PeopleTools. I can't alter any trigger on the table except the PSU trigger that is created by Application Designer for objects that are maintained by mobile agents. More MetaSQL madness. 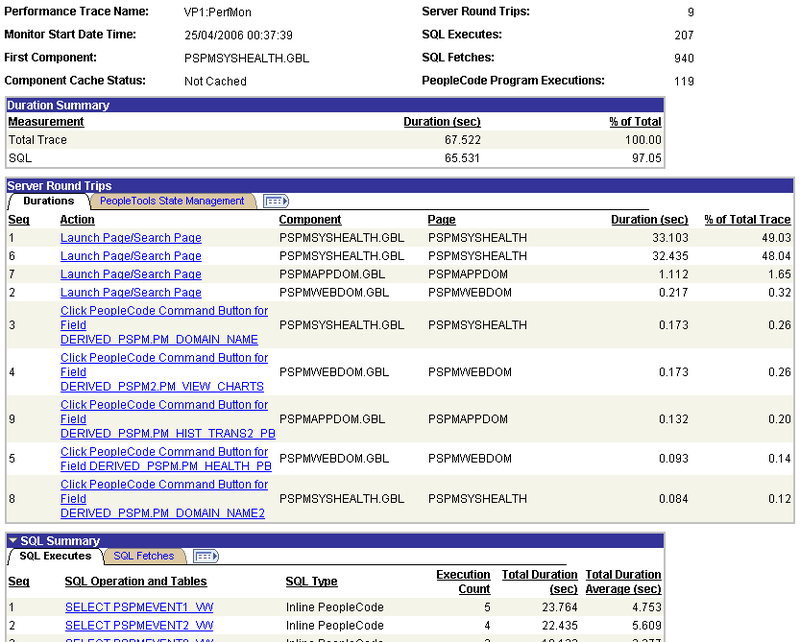 The following SQL was identified as a long running query from a PeopleTools SQL trace. Note the FIRST_ROWS hint. The SQL Statement comes from a SQL exec in the DERIVEDRCSEARCH.SEARCH_BUTTON.FieldChange peoplecode, but it contains the %FirstRows metaSQL which controls how the rows are fetched. The %FirstRows metaSQL is introducing the /*+ FIRST_ROWS */ hint on Oracle. On Microsoft SQLServer it evaluates to TOP(n), causing the query to return only the first n rows of the data set. 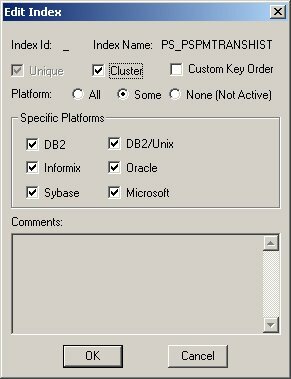 This is a change in behaviour introduced in PeopleTools 8.46 prior to which this macro evaluated to a blank string when PeopleSoft runs on an Oracle database. The solution to my performance problem was simply to remove the hint. The following table shows timings in SQL*Plus for the statement with and without the hints. This hint is deprecated in Oracle 9i having been replaced with FIRST_ROWS(n). FIRST_ROWS is that it uses a mix of cost and heuristics to find a best plan for fast delivery of the first few rows. Oracle’s Performance Tuning and Planning manual was that “Using heuristics sometimes leads the CBO to generate a plan with a cost that is significantly larger than the cost of a plan without applying the heuristic. FIRST_ROWS is available for backward compatibility and plan stability”. The problem is that the FIRST_ROWS hint includes some rules that override the usual cost-based behaviour, including that an index can be used to avoid a sort operation, no matter how expensive the path may be. In most situations FIRST_ROWS is simply an inappropriate hint in Oracle 9i. I have found two support cases (200991709 and 200769258) where this hint was causing a problem, and it is probably in response to these, that there is now a workaround available in PeopleTools 8.46. A new parameter OracleDisableFirstRowsHint has been added to the Database Options section of both the Application Server configuration file (psappsrv.cfg) and the Process Scheduler configuration file (psprcs.cfg). This flag defaults to 0, and should be set to 1 in order to supress this hint. I thought this might be an interesting subject for the first post to a new blog. I recently discovered the Oracle Cost Based Optimizer choosing a poor execution plan for a particular critical SQL statement in a CRM system because the expansion of the %CurrentDateIn macro is excessively complicated. The problem occurs in a delivered view PS_RBC_PACKAGE_VW and and a custom view PS_XX_RBCPKCLTR_VW. The views both contain a pair of date conditions, which are coded in line with PeopleSoft standards. Then the execution time fell to less than 1 seconds. To explain why, I shall use a very simple example that is easy to reproduced. In the following script, I have created a table with a 1000 rows and a few columns. Column B is just for padding so that the rows are not unrealistically small. Columns C, D and E contain some dates. The data is evenly distributed in C and D. In E the distribution is deliberately uneven, there are more dates further in the past. Lets look at the execution plans of a few simple SQLs. Both of the following queries return 4 rows, but the cardinality is very different. In the first statement I have used just the simple TRUNC(SYSDATE), the optimizer has correctly worked out that the query will return 4 rows. However, in the second I have used the expansion of the %CurrentDateIn macro. Because the predicate contains a function, the optimizer uses a hard coded guess that the selectivity of the condition is 5% of the table. If I repeat the queries on column D, the cardinality goes up to 41 (it will in fact return 42 rows, but its close), but the cardinality is still 50. If I now try column E, the calculated cardinality the calculated is now 115, although the queries actually return 22 rows. The optimizer makes a mistake because the data values are not evenly distributed between the high and low values for the column. So this test illustrates that the expansion of %CurrentDateIn prevents Oracle’s CBO from evaluating the selectivity correctly, and that this causes it to use a guess that is sometimes too high, and sometimes too low, but always incorrect. In some cases this will lead to an inappropriate execution plan. If TRUNC(SYSDATE) were used, the optimizer would have better information about the SQL and be able to make better decisions. I say that this is a bug in PeopleTools. There is, of course, a simple workaround. Simply code TRUNC(SYSDATE) in the application as a customisation where necessary. However, there is no reason why the expansion of this metaSQL could not be changed, and delivered as a PeopleTools patch.